In the case of a king and two rooks against a king the stronger side is able to checkmate the opponent without the help of the king. But if the king steps in the checkmate could occur anywhere on the board. 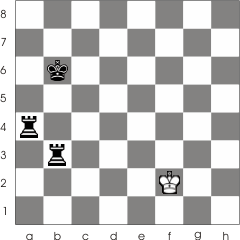 When mating only with the rooks the king is leaded towards an edge of the board by the two rooks. Just take a look at the example. checkmate with two rooks 1... Ra2-a4+ 2. Kd4-e3 Rg5-g3+ 3. Ke3-f2 Rg3-b3 The rook is moved to a safe square. 4. Kf2-e2 Ra4-a2+ 5. Ke2-e1 Rb3-b1 Checkmate. 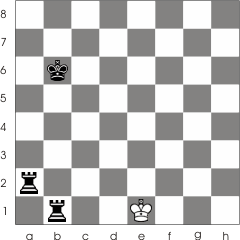 When mating with the king's support, we have a similar situation to that of mating with one rook. 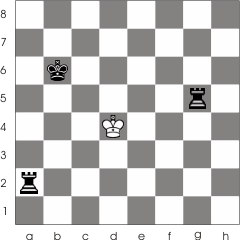 In this case one of the rook takes the place of a chess board edge( So the king can't pass the squares controlled by this rook). This way it could be checkmated even on the middle of the board.